DeKALB, Ill. – The Northern Illinois University wrestling team overcame a late reshuffling of the lineup and still won four matches against No. 19 Kent State on Friday evening at Victor E. Court in DeKalb, but the visiting Golden Flashes left with a 21-12 dual victory in Mid-American Conference action. 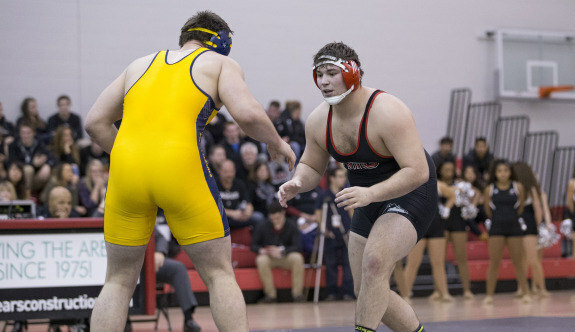 NIU wrestling head coach Ryan Ludwig was proud of the way his team handled the adversity on a night where a few close matches were all that made the difference for MAC-title contender Kent State, despite the Huskies missing their regular 174-pound starter, Trace Engelkes. “I thought we set a good pace tonight. I’m really proud of our guys. We had to make some last-minute changes by bumping up some guys weight classes, but our guys responded and showed resilience and leadership in front of a nice Senior Night crowd,” Ludwig said after the dual. On NIU wrestling Senior Night, redshirt senior heavyweight Arthur Bunce (Munith, Mich./Dansville) capped the dual with a dramatic 5-2 victory over Devin Nye – but his performance was far from the only impressive showing from the Huskies (6-7, 1-4 MAC) against the ranked Golden Flashes (12-3, 5-1 MAC) on Friday. Alijah Jeffery (Marion, Iowa/Linn-Mar) got things going for NIU with a 4-1 decision at 125 over Del Vinas, and then Austin Eicher (Fenton, Mich./Hartland) fought hard for all seven minutes and nearly downed No. 9 Mack McGuire at 133 pounds before eventually suffering defeat via 4-3 decision. No. 15 Steve Bleise (Chelsea, Mich./Chelsea) posted a comfortable 8-5 victory at 141 in the next match to give NIU the lead back, but the Golden Flashes’ one-two combo at 149 and 157 of No. 18 Mike DePalma and No. 2 Ian Miller turned the dual in favor of Kent State with bonus-point wins. With NIU regular 174-pound starter Trace Engelkes (Winnebago, Ill./Winnebago) unavailable, the Huskies were then forced to bump up Shaun’Qae McMurtry (Lockport, Ill./Nebraska) and Andrew Morse (Alto, Mich./Lowell) weight classes in order to fill the lineup. Despite the reshuffling on short notice, Morse held his own at 165 pounds against a ranked opponent, but No. 31 Tyler Buckwalter survived a low-scoring battle, taking the 1-0 decision. Then McMurtry picked up NIU’s third win of the evening as the usual 165-pounder wrestled aggressively at 174 to down Mike Vollant with a comprehensive 9-3 decision. After No. 28 Cole Baxter scored three more team points for KSU at 184 pounds, No. 14 Kyle Conel edged No. 16 Shawn Scott in the night’s only matchup of ranked wrestlers to seal the dual for the Golden Flashes. Conel handed the NIU junior 197-pounder his first dual loss of the season by winning via 9-5 decision thanks to a four-point nearfall move. Bunce was then able to add three more team points for the Huskies with his gutsy Senior Night triumph over Devin Nye, raising his fist in triumph at the final buzzer to the approval of the Huskie fans in attendance. The NIU wrestling team returns to action on Sunday with another home dual against a ranked opponent as the Huskies host No. 5 Missouri in MAC competition for the final wrestling dual of the season in DeKalb for the home team. Admission will once again be FREE for ALL FANS.